We are your One-Stop Job Shop. M-D’s plastics group has the capacity to extrude 15 million pounds annually in flexible, rigid, dual durometer profiles. We also manufactures foam weatherstrip and high-quality components for the door and window market. Plants located in Georgia and Oregon. We are your one-stop source for plastic extrusion. We will create, finish, stock, and deliver your engineered product on your schedule. We will keep your custom dies on file and can deliver more of your product on-time any-time. Don’t have a place to hold stock? We can do that for you too. We will hold and release a set amount of your product at a time of your choosing. The History of M-D Building Products, Inc. The MD story begins in 1920 with L.A. Macklanburg, a German immigrant to the state of Oklahoma. Frustrated with the insidious red dust that was constantly blowing into the house through every tiny crack and crevice around the door and windows, Macklanburg devised a solution: spring-flange weatherstripping. This became the company’s very first product. 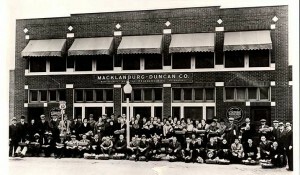 Macklanburg believed he would be successful if he provided quality products at a fair price with unquestioned service. M-D continues to focus on “old fashioned” values that give the company its reputation for quality, products selection and customer service.